I’ve been a terrible sleeper since I was a little kid. In the rare cases where I do manage to wake up refreshed, sleep hygiene is a must: I require a cool, dark, and quiet bedroom at a minimum. Frequent work travel that often results in crossing timezones doesn’t help my cause, and in one extreme example, I went nine hours forward during the summer solstice in Copenhagen where it was light for 20 hours a day. 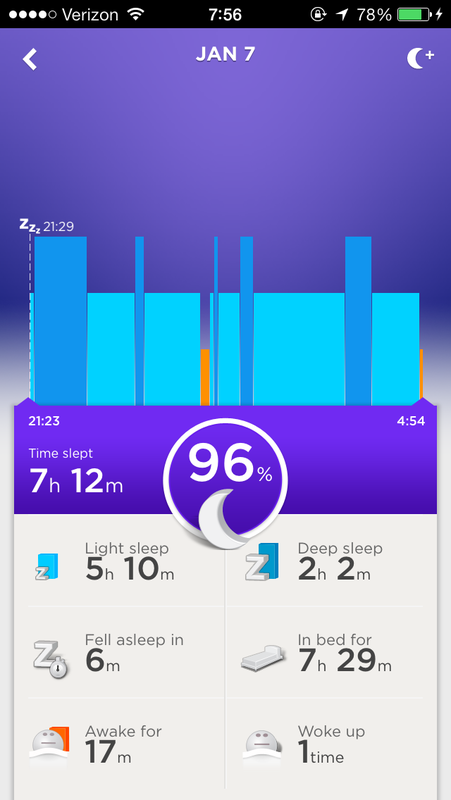 When I caught wind of the Jawbone UP’s sleep tracking capabilities back in June, I grabbed one right away. It provides a concise breakdown of light versus dark sleep along with visibility into how long it takes to fall asleep and number of wake ups. On top of this, it has “smart alarm” functionality – a vibrating wake up that takes place within a light sleep cycle leading up to your desired alarm time. For example, if I set my alarm to 6:00am with a 30 minute window, the band will detect when I’m in light sleep within those thirty minutes and wake me up gently as opposed to a jolting alarm at 6:00 sharp. Now that I’ve had some time to analyze some of my sleep trends, I have a good idea of what a restful night looks like. 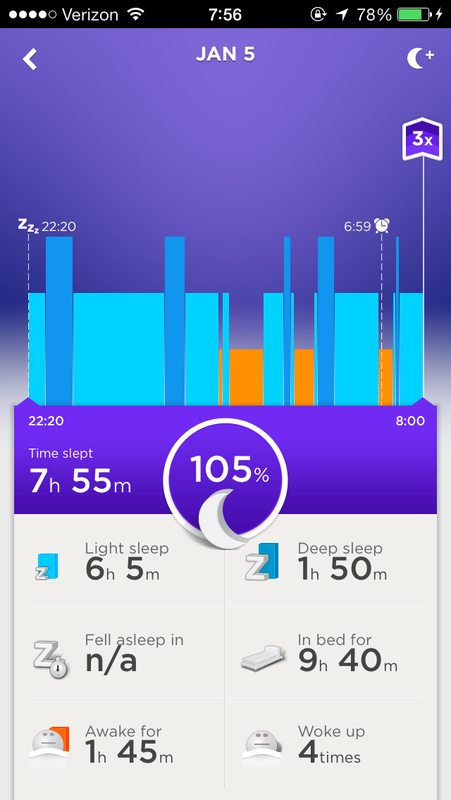 I also know some of the usual suspects for my sleep disturbances – namely travel, caffeine, and alcohol, and have validated my hypotheses many times since I started tracking my sleep. In this post, I’ll focus on my three most cases: a good night’s sleep with proper sleep hygiene, excessive caffeine intake, and alcohol consumption. A good night’s sleep for me means waking up refreshed. This is often correlated to amount of deep sleep I get, and when my percentage of deep sleep approaches 50%, I definitely notice an improvement to my mood, cognitive and athletic performance the next day. What can I say? I like my coffee. When I consume too much caffeine, I typically get much more light sleep than deep sleep. Although I really enjoy coffee, I’m very sensitive to caffeine, and excessive consumption jeopardizes my sleep quality more often than not. I tend to wake up extremely groggy and don’t feel refreshed mentally or physically. Don’t mix booze and sleep. I’ve learned that my single biggest risk factor for poor sleep is alcohol intake. Not only do I tend to get very light sleep, but I wake up, and sometimes stay up throughout the course of the night. After two glasses of wine with dinner last Friday, I woke up four times for almost a combined two hours; this is representative of most nights I drink. As much as I love a Friday beer, I try to avoid alcohol on weekends where I’m very worn down and require restorative sleep. 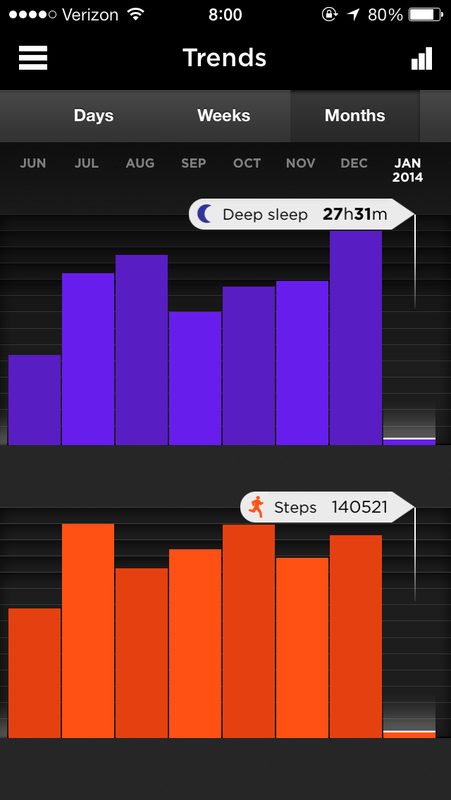 Plain and simple – I’ve noticed a correlation between the amount of deep sleep I get and my activity level as depicted in the graph above – deep sleep vs. number of steps. What the graph doesn’t take into account is the amount of time I spend swimming, biking, and weightlifting – I can attest that the step counts that are lower than expected based on a high deep sleep count actually should be much higher when those three activities are factored into the equation. When it comes to training for my A-races, the Jawbone helps me decide when to rest and when to push harder. 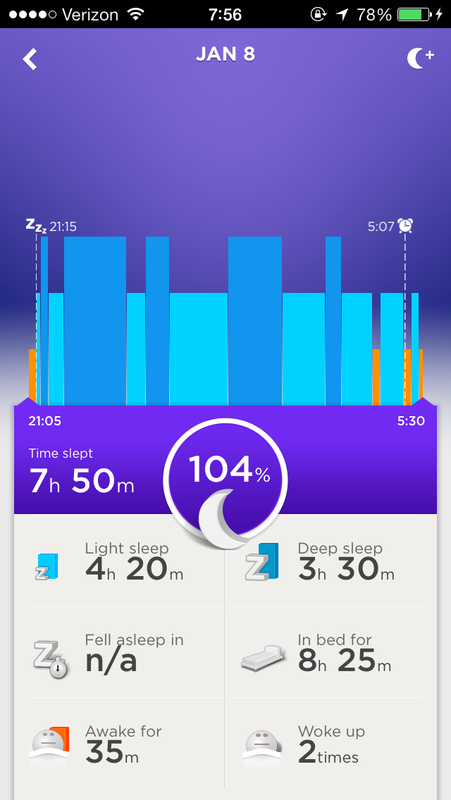 Taylor started tracking her sleep over Christmas break as well, and we both highly recommend the Jawbone UP to anyone who’s considering a fitness tracking band that emphasizes sleep functionality. What an awesome analysis! thoughtful and clearly explained.